I shot this photograph in Bona Allen Mansion in the city of Buford, Atlanta, Georgia. 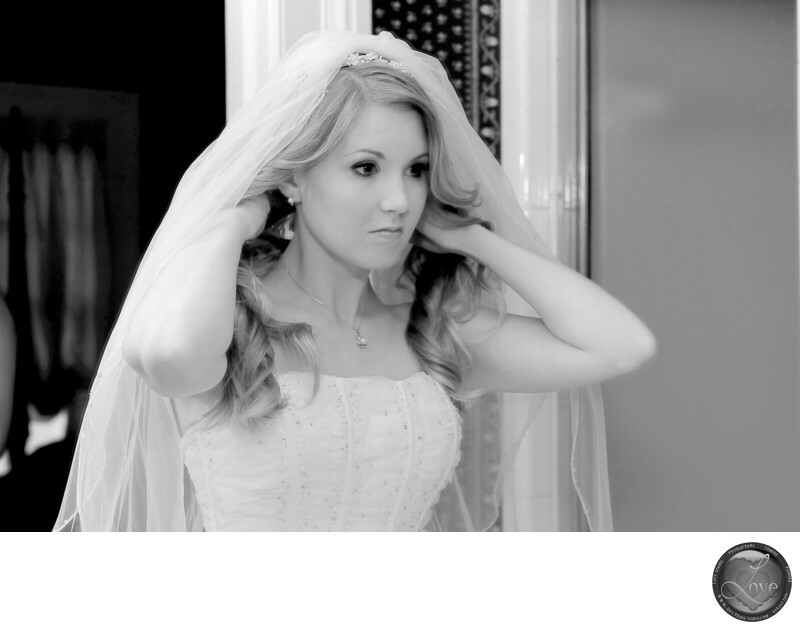 The photograph was taken while the bride was getting ready in front of the mirror. Her makeup was done and she was fixing a few things by herself. In fact, the bride's older sister was the makeup artist for this beautiful wedding. The bride is fond of black and white photographs. She requested me to get half of her wedding pictures in black and white. The Bona Allen Mansion is a beautiful wedding venue for midsize crowd. There is plenty of green and pleasant scenery outside the building as well. I love photographing in an old style mansion. There is a flavor of aristocracy. The Dining hall, wedding ballroom, guest gathering and cocktail area, all have a look and feel of elegance. If you guys would like to hire me please feel free to contact me at 678-557-7419 . This photograph was taken in October 2009 using a Nikon D700 camera with Nikon 24-70 F2.8 lens attached to it. The natural lights were coming from the window behind the bride and, the dressing table mirror is located facing up toward the window. I used several Nikon SB900 speed lights flash in order to get the right exposure. The parents of the bride ordered a 36X24 large print of this picture for framing. Location: 395 E Main St, Buford, GA 30518, Phone (770) 271-7637.